Caterpillar DP30N used diesel forklift truck from 2010 for sale. This used forklift truck is in excellent condition and has done 7680 hours of service. Fully serviced and checked and this used forklift truck also comes with a Through Examination Certificate. Please have a look at our other used forklift trucks or maybe you want to browse our new forklift trucks. Forklift truck hire is also available for this forklift. 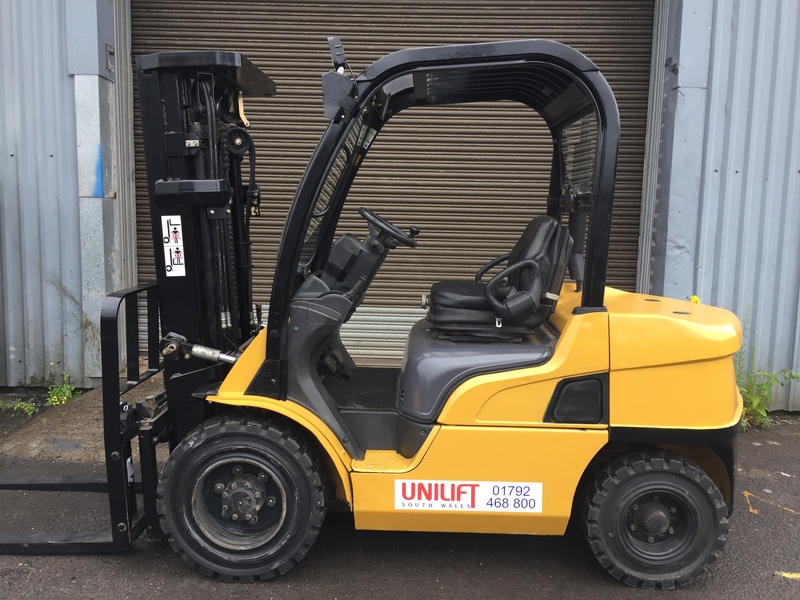 Unilift South Wales offers a complete forklift truck solution throughout South Wales including Cardiff, Swansea, Newport, Neath, Port Talbot, Bridgend, Llanelli, Carmarthen and Milford Haven. We can also offer a peace of mind forklift truck maintenance and service contract to ensure your forklift truck is always maintained to the highest standards.